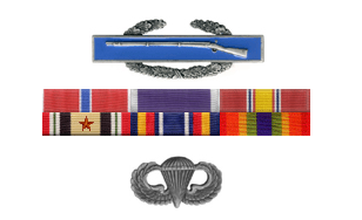 Hometown: Howell, New Jersey, U.S.
Died: March 29, 2003 in Operation Iraqi Freedom. Unit: Army, 2-7th Infantry, 3rd Army Infantry Div., Fort Stewart, Ga.
CURTIN - Corporal Michael E., age 23, on March 29, 2003, of Howell Township, N.J., beloved son of Joan M. and Michael J. Curtin, dear brother of Daniel, Katherine, Jennifer and Stephanie Curtin, grandson of Elsie and Edward Larsen and Catherine and Michael J. Curtin, nephew of Karen and Robert Thompson and Patricia and John Curtin, uncle of Kayla Curtin, cousin of Robbie Thompson, Kasey Thompson, Jonathan Curtin and Carrie Ann Curtin. Visiting at The Church of St. Veronica, 4215 Route 9 North, Howell, N.J., on Thursday 2-4 and 6-9 p.m. Funeral Mass Friday at 10 a.m. at the church. Interment to follow in St. Anne's Cemetery, Wall Township, N.J. 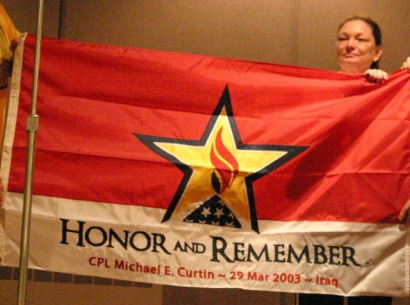 In his last letter home, Michael E. Curtin told his family that he had been promoted to corporal. Curtin, of Howell, N.J., and based at Fort Stewart, died March 29 in a suicide bomb attack at an Army checkpoint. Curtin joined the Army in May 2001 after high school graduation. PHOTOS BY DAVE BENJAMIN A new memorial garden at Howell High School will give members of the school community a peaceful place to reflect. New garden at school dedicated in memory of Cpl. Michael E. Curtin. U.S. Army Cpl. Michael E. Curtin, the first Howell High School graduate to lose his life in the line of military service to the nation, will now have a memorial garden and memorial monument plaque in his honor. Ceremonies were held Friday to honor Curtin, who was killed in action in Iraq on March 29. Michael and Joan Curtin listen to the remarks of speakers as the memorial garden honoring their son, Army Cpl. Michael E. Curtin, is dedicated on Friday. Gov. James E. McGreevey joined local officials and Freehold Regional High School District administrators at the high school to honor Curtin. "This is a difficult time in our nation," McGreevey said. "On Sept. 11, 2001, our nation was viciously and cowardly attacked in an unprovoked act of war. It was then that the nation learned the war against terrorism would be fought here at home, as well as in Iraq. "Michael risked his life to defend the ideals of a free government that we enjoy here today. It was Michael’s blood and sacrifice that addressed the threat of that Iraqi regime. "As a community, as a state and as a nation, we pause to recall the individual and collective debt of gratitude we owe Michael Curtin on this day," the governor said. It was a rainy Friday, a day that appeared as if the sky were crying. Students from the ROTC program at Colts Neck High School presented the colors, and Howell High School Rebel Yell sang the national anthem. Julie Ann Suppa, president of the student council, addressed the gathering, saying, "Today we pay tribute to Cpl. Michael E. Curtin, a 1998 graduate of Howell High School, a young man who loved his family and loved life, a young man who made the ultimate sacrifice when he was killed by a suicide bomber during Operation Iraqi Freedom, a young man who will be forever remembered by our nation, our state, our county, our township and by every student who passes through the halls of Howell High School. "The news of Cpl. Curtin’s death reached the heart of Howell High School," said Suppa. "Many, if not all, students reacted immediately. Until then, the war seemed so far away, and suddenly it became a harsh reality." Suppa said the school responded and plans were made to remember Curtin with a $1,000 donation to the Michael E. Curtin Scholarship Fund. "Most recently the National Honor Society took part in a fund-raising effort to help raise funds for the scholarship established in Michael’s name," the student council president said. "With the assistance of the community, the peer leadership class collected more than 10,000 items to be sent overseas to the troops in Iraq." Suppa said Curtin’s sacrifice will be forever remembered by future generations of Howell Rebels and by the entire community. In her remarks, Karen Thompson, Curtin’s aunt, said, "We are forever grateful and humbled by this living legacy in honor of Michael. As important as this day is for our family, I realized that this is a historical moment for the students of this facility. How privileged and honored you must feel to have a brave heart, a dedicated soldier, and a true American hero, who once walked the halls of Howell High School. "Michael fought courageously on a combat battlefield a long distance from home to protect the freedoms which you and I enjoy each and every day, and perhaps at times, take for granted. I will never again take those freedoms for granted, nor should any of you. I know now that they are not free at all. Rather, they come at a costly price, and Michael paid that price for all of us. "Our young children have been forced to learn that freedom does not come easily. With the unfortunate events of Sept. 11 and the terrorism that occurs every day around the world, we can no longer take that freedom for granted," Thompson said. Commenting on the garden memorial, Warren Smith, superintendent of the Monmouth County Shade Tree Commission, said he and Zig Panek designed the garden. He noted that all the bushes and plantings were donated by local merchants and business owners. He credited Monmouth County Freeholder Thomas J. Powers with getting the ball rolling. "We built it with [the help of] the Monmouth County Shade Tree Commission workers and the grounds crew," said Panek. "The idea was basically an inspiration. Michael died for us, protecting us, and although it was not an easy task, it was an inspiration. What I looked at was an area for meditation where students can look back and always remember Michael." "I think the garden is magnificent," said Powers. "Originally it started with the idea of putting up a tree and then some other people got involved in addition to the country employees. It’s marvelous." Powers said students will now be able to come out to the garden, sit on the benches and reflect on the young man who gave his life. Ilse Whisner, public information coordinator for the FRHSD, said the garden was designed so that the plantings will bloom during the three seasons students are in school. Then the plantings will be green all summer. Monmouth County Freeholder Ted Narozanick said, "Words cannot describe the sacrifice made by Cpl. Curtin, nor can they convey the sense of loss. Nothing we say here today can fully honor his memory or ease the pain of his family. However, we can simply say thank you. As long as people value liberty, we will remember the sacrifices made by American servicemen and -women in Iraq. Thank you, Cpl. Curtin, for your bravery, your integrity and for making the greatest sacrifice of all. … In their own time, the people of Iraq will say thank you for liberating their country from tyranny and giving their children a chance for a brighter future." McGreevey presented the New Jersey Distinguished Service Medal to the Curtin family and said, "To those individuals who have served selflessly in the cause of our nation, representing the state of New Jersey, it is an honor to present [this medal] to the Curtin family." In his remarks, FRHSD Superintendent of Schools James Wasser said, "It’s somewhat difficult for me to speak about Michael, because our paths have never really crossed. But I had the fortunate opportunity to meet the Curtin family. "What they told me were such nice visions of what they remember Michael to be, a handsome, bright and caring young man, committed to serving his country and protecting our freedom. His memory will live on. … My best wishes [are] for the family to stay strong. God bless you, and I know that God is taking care of Michael." Principal Barbara McMorrow summed up the events of the day, saying, "Today was a wonderful tribute to Michael Curtin’s memory and to the Curtin family. Most of all, this was something that the students [helped to] create and organize. It was the participation that made it so special. This year, Memorial Day will have an extraordinary significance for the students. For them, Memorial Day will always be Michael’s day."